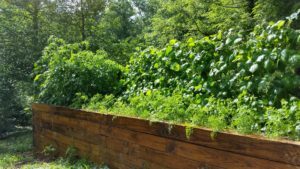 The regular rains this year have resulted in a healthy vegetable bed. streaked flesh. Some consider the “Brandywine Pink” to be the best-tasting heirloom of all time. “Black Pearl” cherry tomatoes are purplish black with a deep, rich, and sweet flavor. 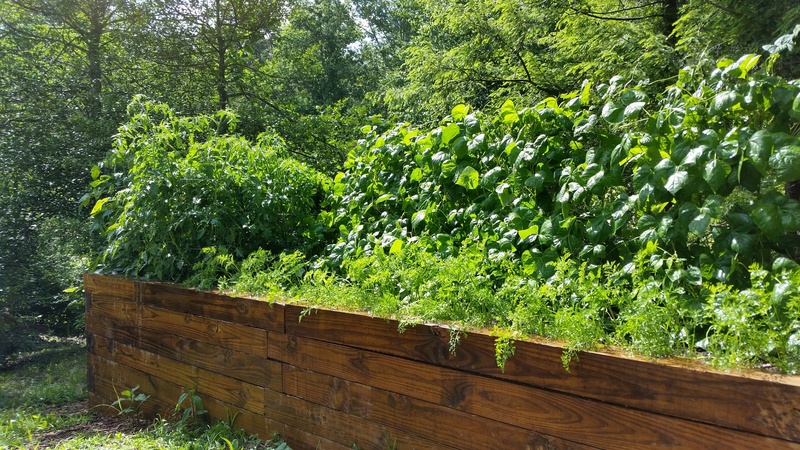 We are looking forward to eating these fresh in salads, in a chilled gazpacho, roasted, and in a delicious summer soup. Tomatoes originated in western South America. The Aztec word tomatl gave way to the Spanish word tomate from which our English word tomato is derived. The indigenous peoples of Mexico began using tomatoes as a cultivated food. The Spanish, during colonization of the Americas, discovered tomatoes and brought them to Europe. Tomatoes are about 95% water and are a good source of vitamin C.
Bring to a boil and then simmer for 45 minutes. Strain ingredients in a colander, pressing on vegetables to get all the juice out. Discard vegetables. Bring to a boil again and add one diced tomato and torn basil and parsley to taste. Correct seasonings. This is delicious served with garlic croutons and shaved parmesan cheese. This recipe yields about eight servings. Please note that this recipe is best when using tomatoes in season. If you make this recipe with out-of-season tomatoes you may want to add some tomato juice to ensure a deep, rich flavor. Enjoy! We have just discovered Anakeesta! As busy local innkeepers, we rarely take the time to enjoy the many attractions that appeal to our out-of-town guests. We are so glad that we recently had the opportunity, thanks to the Gatlinburg Chamber of Commerce, to explore our area’s new aerial theme park. Anakeesta is a Cherokee word referring to high ground. It literally means “place of the balsams”. The word also refers to the massive rock formation that encompasses many of our local mountain peaks: Charlie’s Bunion, Chimney Tops, and Mount Kephart. The aerial park is designed to be a mountain playground for all ages. Bob and Karen Bentz and their family bought more than 55 acres of pristine mountain land in 2014 and proceeded to create their vision. They are environmentally sound stewards and the attraction offers a family-oriented experience. 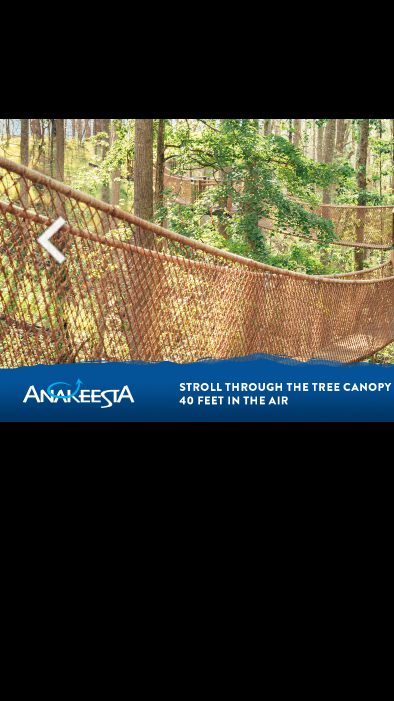 The canopy walk is 40 to 60′ from the forest floor. We entered via an open-air four-person chair lift. The other option is an enclosed gondola with a capacity of six. The ride up 600′ to the summit was beautiful! We were enchanted by the canopy walk through the trees. A series of 16 connected sky bridges, 40 to 60′ above the forest floor, offered spectacular views. While we did not try it out on this visit, we enjoyed watching others on the dueling zipline. There are several options for dining. We chose to try out the Cliff Top Grill and Bar. We enjoyed lingering over our drinks on the outdoor pavilion and admiring the mountain peaks that were the backdrop to our dining experience. The south side of the park is located in an area that was badly scorched by the 2016 fire, the most devastating in the state’s history. A memorial walk pays tribute to the brave men and women who fought the fires and to the resilience of those impacted by the tragedy. Many of our guests are fishing enthusiasts. They find the Buckhorn Inn makes a great base of operations for spending the day on the water and returning home to pampered comfort. Reports are that the fishing is good this spring. Today we welcome guest blogger, CJ Stancil, to give us the latest. 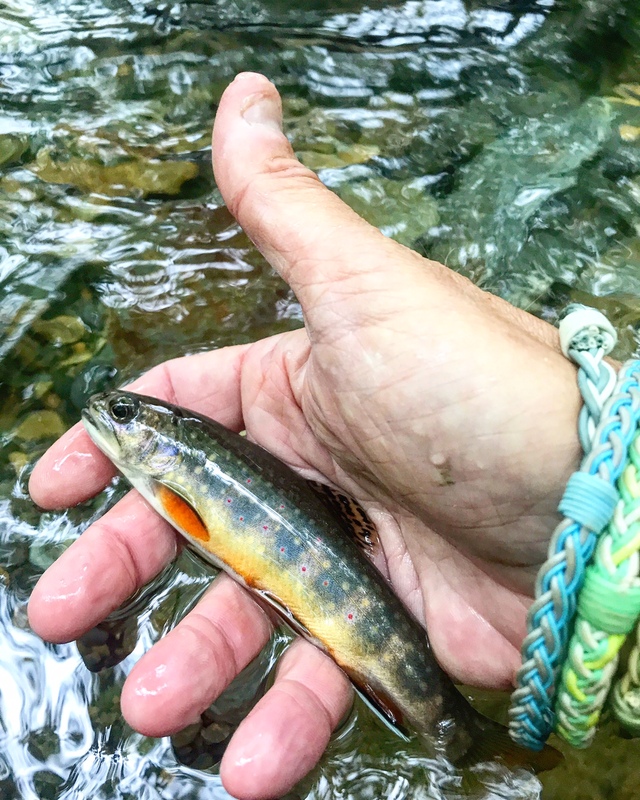 This time of year is a beautiful time to fish in the Great Smoky Mountains National Park. Not only are the trout biting but the scenery is amazing. The Park has abundant species of wild flowers and plant life that are just now coming into peak. Wildlife that call the Smokies home in its half-million acre wilderness are black bear, whitetail deer, turkey and elk. The Park has nearly 800 miles of fishable waters that hold trout. 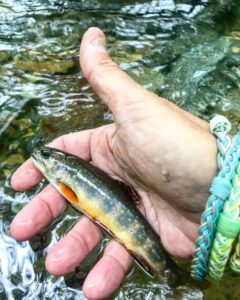 Wild brown trout, rainbow trout, and native brook trout are the species you will find here. The Park has more than 800 miles of fishable water. Many of our guests have fished with CJ and report a great experience. You may contact him to book a trip through the Smoky Mountain Angler http://www.smokymountainangler.com or by email [email protected] CJ also has offered his phone number 931-801-4204. To see some photos of beautiful trout, be sure to follow him on Instagram at @dancewithtrout.